﻿Does Billy condone violence against reporters? Let his Twitter feed be your guide. In the likely event that you’ve been on a media blackout,we have some horrible news for you. 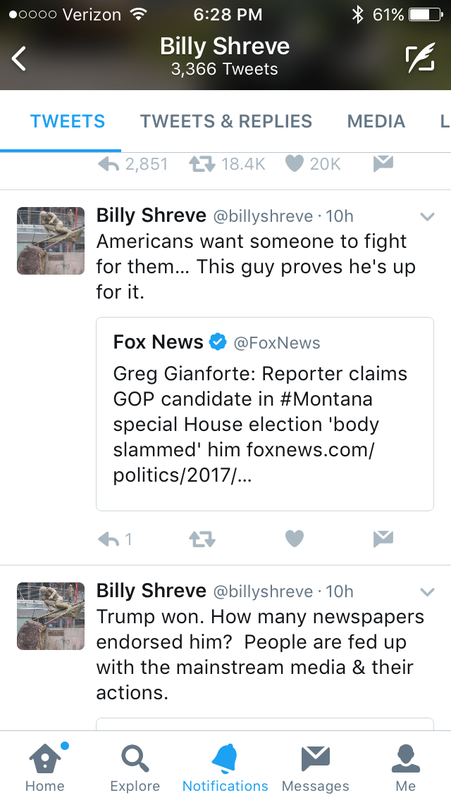 A Montana congressional candidate, Greg Gianforte (R-Repulsive), viciously attacked a reporter yesterday. According to eyewitnesses, this fetid excuse for a human being did not like being asked questions about policy directly related to his job as a U.S. Congressman. Therefore, he had no choice but to wrap both of his demon hands around said reporter’s neck and body-slam him to the floor. He broke the reporters glasses and later lied about the altercation, claiming the reporter grabbed him by the wrist first. (A claim that was peppered with the words “liberal reporter” as though that was reason enough for the attack.) The FOX news reporters who were witnesses to this assault refuted that claim and said that the reporter, Ben Jacobs, never touched him. The sheriff charged Gianforte with assault, which unfortunately is only a misdemeanor. If you are going to be a politician, the press is going to ask you questions about policy. Everyone knows that, right? The only conclusion that we can come to here is that Billy wants a dictatorship. Because you know what happens when the government attacks the press? That’s right, the death of democracy. Take a look at this world press freedom map that hangs in the Newseum. See the red countries? Those are the ones that don’t have freedom of the press. And guess who else doesn’t have freedom in the land of the red? That’s right, just about everyone else. Shall we do a GoFundMe to arrange for a private tour for Billy to visit the Newseum? News is not fake just because you don’t like it moron! Just because you don’t share the same opinions that actual journalists who do real research and conduct in-person interviews do doesn’t mean they are wrong! And it certainly doesn’t mean they should be attacked for doing their job! Good Saffro on a cracker, wake the hell up, man! Of course, we had to peruse some more of this high thinker’s feed. Guess what else he believes? That’s right people! Healthcare is a privilege!! A PRIVILEGE! So next time you are suffering from some horrible disease and have lost your house and every damn cent you’ve ever had because you couldn’t afford the PRIVILEGE of healthcare, please remember to thank heartless bastards like Billy. Or at least haunt them from the other side. It really is something else to watch these people claim to care about the common man out of one side of their mouths, while simultaneously spouting off that healthcare is a privilege out the other. We can come to no other conclusion except that Billy hates democracy. Anyone who would advocate the eradication of the press, condones violence against those brave enough to find out the truth, and would label healthcare a privilege is someone who doesn’t really care about democracy. While it is true that women in Ancient Mongolia had more legal rights than women in other parts of the Ancient World, we don’t think you can call a man who was responsible for over 40 million deaths a champion of anything. But hey, he was a dictator and that seems to be what old Billy likes! Previous postNatelli is getting another hearing and what the hell is going on in Carroll County? Next postBilly laughs at violence; abhors free press–the sequel!